Are you hosting Thanksgiving in your apartment this year? Read our blog for some helpful hints on how to get the most out of your space and plan a great day for friends and family. 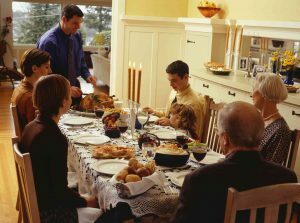 As the holiday season is approaching, every family and group of friends are working out the details of Thanksgiving dinner. If you have the duty of hosting this year and are a little unsure of how you’ll manage Thanksgiving in a smaller apartment, we’ve got some tips just for you! Remember, Thanksgiving is all about coming together and expressing thanks for our loved ones, so rather than stressing out over the planning, try to relax and enjoy the day. You likely don’t have a table big enough to fit a large group of people- and that’s okay! If you have the space and feel as though it will be useful in the future, investing in a folding table is a great solution. These tables can be quite inexpensive and may be just what you need for hosting a Thanksgiving dinner. However, if you don’t have the room or budget, there’s nothing wrong with proving chairs for guests and letting them eat from their lap. Get all of your chairs from your living room, kitchen, and bedroom into one area for everyone to sit together. As long as everyone’s together and eating a good meal, the furniture they’re eating from won’t matter. Since it is such a giving holiday, your neighbors will likely be happy to help in any way they can. If you’re running low on anything and need a helping hand, don’t be shy to reach out to your neighbors. Even if you’ve never met before, Thanksgiving is a great time to make the connection. You may make a new friend and another guest to your holiday dinner! If you need something specific that none of your neighbors seem to have handy, the thrift shop or dollar store are always great options for someone on a budget. Whether you’re meeting with friends or family, you should always provide some sort of food or drink for the get-together. Apartment life can make it difficult to cook many things at once, so don’t be afraid to ask your guests for help! If it’s a large gathering, it’s very helpful to make a list that everyone can add to with what they’re bringing. This way, you won’t have to spend days cooking, and you’ll be sure you won’t have multiple versions of the same dish. This entry was posted on Thursday, November 16th, 2017	at 3:18 pm	. Both comments and pings are currently closed.